Click on the graph to expand it. The Fermi National Accelerator Laboratory or "Fermilab" is owned by the United States Department of Energy and is dedicated to the study of High Energy Particle Physics. Until it was shut down in 2011, the Tevatron superconducting accelerator was the most powerful elementary particle discovery tool in the world. Today that distinction is held by the CERN laboratory in Geneva, Switzerland. The Tevatron collided counter-circulating proton and antiproton beams around its 4-mile circumference to create new particles, such as the top quark. The graph to the left shows global annual antiproton production since their discovery in 1954. 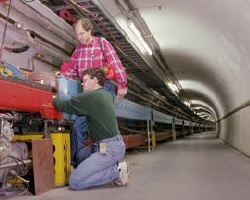 From 1980 until 2011 the Fermilab antiproton source was the dominant source of antiprotons in the world, culminating in a production rate of 2 nanograms per year. Sytematic antiproton production only takes place at CERN at this time, and only at 1% of the peak Fermilab rate. The Main Ring was the original high energy particle accelerator at Fermilab. It was originally designed to accelerate protons to a kinetic energy of 400 Gev (400 billion electron-volts). With the construction of the Tevatron (originally called the Energy Doubler), the Main Ring was optimized to accelerate protons up to only 150 GeV (the injection energy of the Tevatron). Later the Main Ring was modified to also accelerate antiprotons to injection into the Tevatron, but in the opposite direction as the protons. In the picture to the right the Fermilab Main Ring is top accelerator with blue magnets disappearing around the curve of the tunnel. 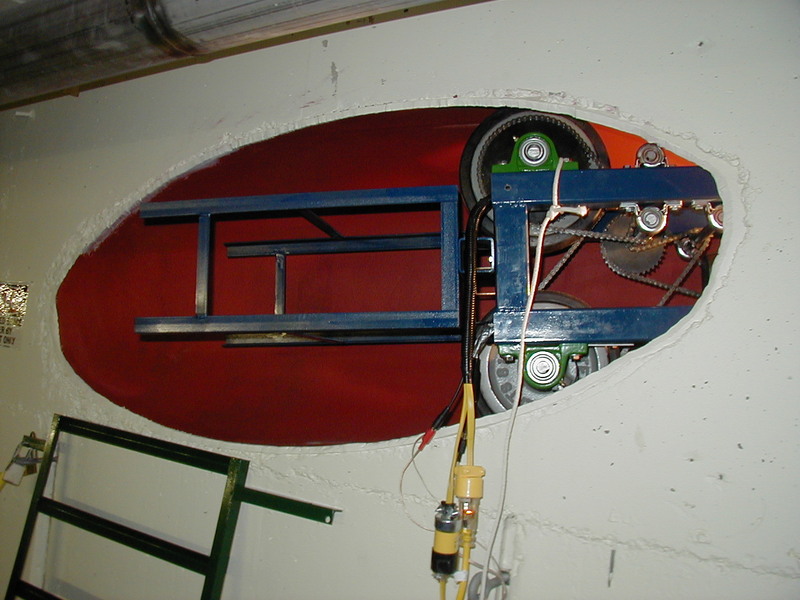 The bottom accelerator, composed of the red magnets, is the Tevatron. In the mid-1990's the Main Ring was retired and the Main Injector was newly built in its stead. Like the Main Ring in its latter years, it had two missions. First, to accelerator protons and antiprotons to a kinetic energy of 150 GeV for injection into the Tevatron. The second was to accelerator an intense proton beam to 120 GeV every 1.5 sec for delivery to an antiproton production target. For every million protons on target, approximately 20 antiprotons were produced and cooled for eventual injection into the Tevatron. Both the Main Ring and Main Injector had a minimum of kinetic energy of 8 GeV. When protons are injected from the Booster ring, or antiprotons are injected from the Antiproton Source complex, they are captured in a radiofrequency system that can either add or subtract kinetic energy. The purpose of this study is to show that antiprotons can be decelerated from a kinetic energy of 8 Gev down to 1 GeV. Below 1 GeV antiprotons can be further decelerated by several techniques in order to study the use of antiprotons for propulsion, medical therapies, and homeland security applications. Because they are more plentiful, these studies were actually carried out using protons. Early studies took place in the Main Ring, while later Main Injector studies took place in the Summer and Autumn of 2000. Preliminary results including the graph to the right were published in the Proceedings of the 2001 Particle Accelerator Conference. Early results were very encouraging, with early results showing deceleration down to a kinetic energy of 2.2 GeV. At that time the limitation was in the amound of radiofrequency voltage available to subtract energy from the proton beam. The continuation of these studies, demonstrating deceleration down to a kinetic energy of 1 GeV will be proposed in a future crowdfunding campaign. While the antiproton deceleration study was initially funded by the U.S. Department of Energy, starting in October of 2000 a series of companies located in Newport Beach, CA picked up funding. Using equity funding, this funding lasted through the beginning of 2002. A major accomplishment during this time was the installation of an antiproton extraction line at Fermilab. Fermilab was paid $153,000 to design a facility for low energy antiproton physics. With moral support from NASA, Fermilab performed the design for such a facility, including a tranport pipe that would house the particle accelerator magnets needed for the extraction of antiprotons from the Main Injector up to the facility. As shown in the picture to the right, this transport pipe was fabricated and also installed with this amount. The concrete shell of the excavated Main Injector tunnel can be seen near the bottom of the photograph, extending in the direction from 7 o'clock to 2 o'clock. 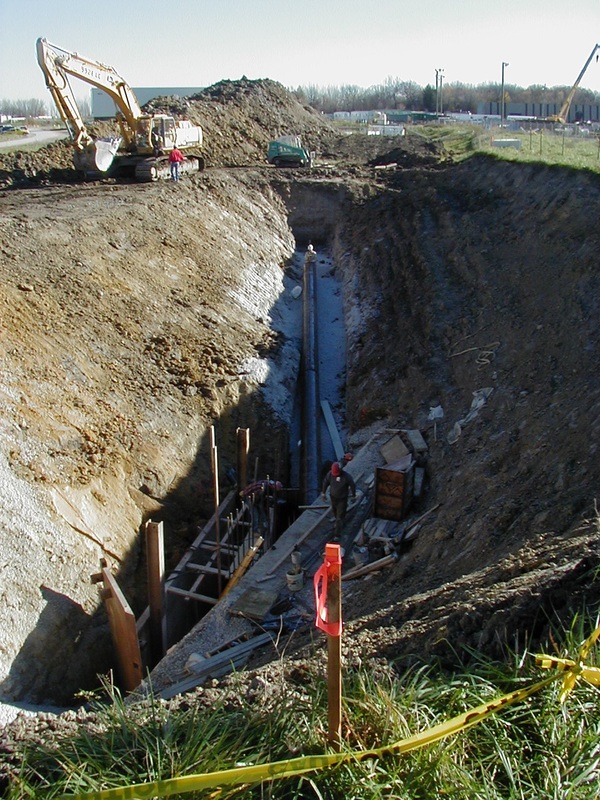 The 2 foot diameter steel transport pipe runs up the middle of the picture down inside the trench. At the facility end, the pipe was welded shut at a depth of approximately 9 ft. below grade. On the Main Injector side the pipe penetrated the concrete tunnel wall at an elevation with respect to the Main Injector that allows decelerated antiprotons circulating in the Main Injector to be delivered to the future facility. Before the low energy antiproton facility could be built at the opposite end of the transport pipe it was necessary to measure the radiation levels at that end during normal Main Injector operations. Those radiation levels, especially neutrons, would determine shield was thicknesses and facility access rules for eventual antiproton researchers. In the picture to the left the installed transport pipe is seen inbedded in the concrete wall of the Main Injector tunnel. Inside the pipe is a robot we built to carry the radiation monitors up and down the pipe. These monitors were eventually carried in the blue framework at the back of the robot. The radiation verification measurements found that while there were low levels of neutron exposure near the middle of the pipe, by the time the robot reached the end of the pipe there was no significant radiation.